The figures who people Njideka Akunyili Crosby's large-scale works—hybrids of painting, drawing, collage, and printmaking—inhabit familiar-looking domestic interiors. They appear quiet and pensive, poised in the moment before glances turn into conversation. The Nigerian-born artist, however, makes their voices heard—ruminations on the day-to-day negotiations of postcolonial life once so obvious as to be assumed but which have taken on greater urgency as the issues of global immigration threaten to subsume them. Trained at Swarthmore, the Pennsylvania Academy of Fine Arts, and Yale, Akunyili Crosby uses the languages and strategies of Western art, absorbing and subverting classical approaches in order to express ideas more pertinent to our times. Human interactions often serve as focal points in her works, revealing how immigrant life merges—and rattles—disparate identities. 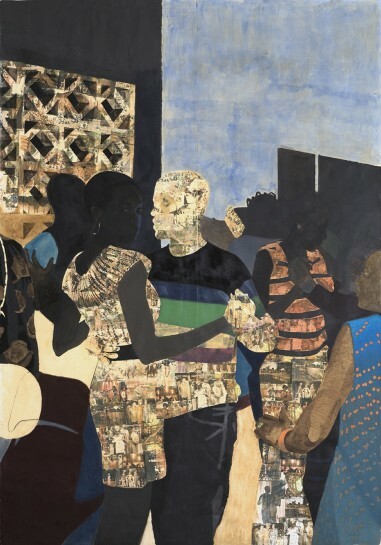 Despite the daily power struggles that fragment, divide, and segregate, Akunyili Crosby expresses the desire for wholeness in tight figurative compositions that contain layers of personal memories and of Nigerian culture and politics. Her survey exhibition at the Norton Museum of Art this past spring, the Prix Canson 2016 this summer, her participation in the Biennale de Montréal, along with her first solo show in Europe atVictoria Miro Gallery (London) this fall—all attest to the artist's rising prominence and the clarity of her vision. Erica Ando You moved to the US when you were seventeen. Did you come with your whole family? Njideka Akunyili Crosby No, I moved to the US with my sister. My parents won the green-card lottery. Without that, we would have never been able to come to school in the States; my parents could not afford it. But as a student with a green card you have access to the same financial aid that citizens have access to. We didn't have money for the whole family to move, and my mom had just started a new government job, so everyone stayed in Nigeria until college. When I graduated high school, my older sister and I, who were in the same class, moved together to Philadelphia because we have another sister and a brother who were studying at the University of Pennsylvania and at Penn State. EA Were you immediately enrolled as students? NAC We took a gap year, which was a really great idea. We acclimatized to the new country and culture outside of college. That year was our time to get to know the United States of America, to study for our SATs, and to take classes in things we wouldn't have learned in Nigeria. I took a calculus class, an American history class, and an American literature class at the Community College of Philadelphia. And my fourth class was a painting class, because I needed something fun to lighten the load. That was my first oil-painting class, and it was taught by Jeff Reed, who eventually advised me to apply to Swarthmore. EA So at that time you hadn't committed to art? NAC Oh no, it was just a fun thing I did on the side. EA When did your commitment start to grow? NAC That didn't happen until my senior year of college. In my junior year at Swarthmore, I was taking a lot of advanced biology and organic chemistry classes, doing my pre-med requirements. I took one or two art classes every semester, again, to lighten my heavy science load. But it got to a point where I realized I was enjoying my art classes more. It slowly became clear to me that art was where my heart was. There was more urgency.